Speedo Cancels Its Sponsorship Deal With Ryan Lochte : The Torch Saying it can't condone Ryan Lochte's behavior in Rio, swimwear company Speedo says it's donating part of Lochte's fee — $50,000 — to Save the Children, earmarked for children in Brazil. 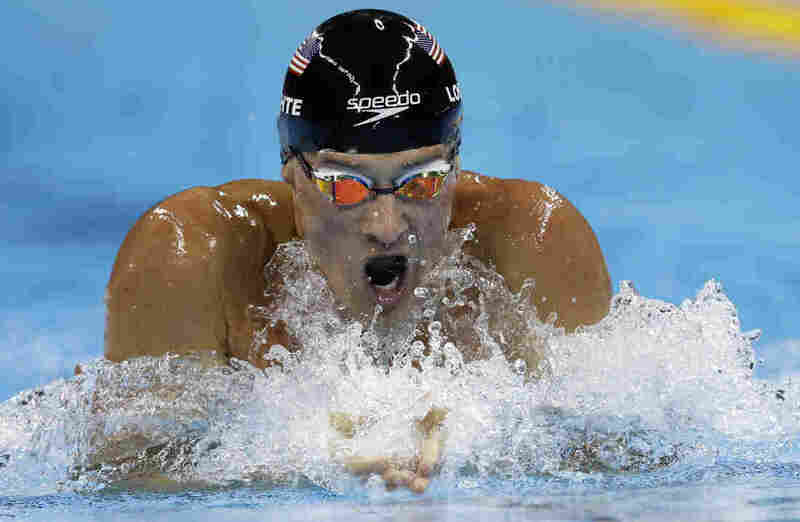 Ryan Lochte competes in the men's 200-meter individual medley final at the Summer Olympics in Rio de Janeiro on Aug. 11. A couple of days later, he reported he had been robbed at a local gas station — a story that turned out to be false. Now Speedo, one of his major sponsors, says it's dropping him. Saying it can't condone Ryan Lochte's behavior during Rio's Summer Olympics, swimwear company Speedo is ending its sponsorship deal with the decorated American swimmer. The announcement comes after Lochte and three other swimmers were caught in an embarrassing episode in which Lochte claimed to have been robbed at gunpoint — a story that Rio de Janeiro police and U.S. officials found to be a fabrication. Lochte left Brazil before police could seize his passport and question him about his allegations. But revelations about that night continued to emerge, and his teammates were only allowed to leave the country after giving new testimony to local authorities. Speedo USA says it will donate part of Lochte's fee — $50,000 — to Save the Children, earmarked for children in Brazil. "While we have enjoyed a winning relationship with Ryan for over a decade and he has been an important member of the Speedo team, we cannot condone behavior that is counter to the values this brand has long stood for. We appreciate his many achievements and hope he moves forward and learns from this experience." Lochte's robbery claim was challenged by Rio police who said that he and other swimmers vandalized a gas station bathroom and were then forced by security personnel to pay for the damages. That turn of events forced the U.S. Olympic Committee to issue a formal apology to Rio and the people of Brazil. Both the USOC and the International Olympic Committee are reviewing the matter, which USOC CEO Scott Blackmun said was "not acceptable."